Here is a good criticism of Destiny2's levelling system. i'm not sure what the solution is though. The solution is the same as every other game with the problem of RNG loot. Provide alternatives that give targeted loot. Let the player spend 100 shards of insert cool name to buy a 'Powerful Cloak' instead of a Powerful Engram that can be anything. You don't need to invent the wheel here. Its been done hundreds of times already. I like levelling in Borderlands better than Destiny. However, Borderlands and Destiny can't be lumped in together because a gun or shield in Borderlands is not assigned a power level. i think Bungie wants you to have the feeling you "crafted" and/or painstakingly "built" the guns and armour you use. Outright buying the item makes that feeling go away. The way things are structured in D2 I do not think the problem is as easy to solve as you indicate. The proposals made by the guy in the video are worth a shot. Aren't the pinnacle weapons exactly that? Honest question, I have no idea. Which brings me to my next question: Do the pinnacle weapons have a fixed power or is it dynamic to my own power? I have just finished the Forsaken campaign and reached 500 power. Pinnacle weapons drop at least +2 to your current power so they stay as powerful drops. I didn't understand what an "Augmented Weapon" was until i saw this video. You get an extra perk with a choice between 2 perks. the Ace of Spades is a solid weapon in both PvE and PvP. It is a high quality general usage weapon. I'm not up on the cutting edge meta so it might not be the very best weapon for certain specific activities. do whatever you feel like doing. Dreaming City "powerful gear" is more power levels above your current level than other "powerful gear" activities. That said, many of those activities are not viable until you are well above 500 power. If you're 500, you should indeed aim to unlock the Dreaming City. You should then focus on doing Dreaming City activities until you can do the raid (560+ generally speaking), if you want to do it. If you don't want to do the raid, the levelling process will be much slower but you can eventually get to 600 just doing weekly milestones and Dreaming City stuff. I personally liked playing Gambit quite a bit, and I focused on doing Heroic Strikes as well. Once you are around 540, you can get fireteams together and do the Nightfall Strike, which is some of the better content in the game. Once you get to 580+, you can do The Shattered Throne when it is available, which is on a three-week cycle. The next week available is next week, which is likely quite unrealistic if you're 500 right now. Like the raid, this is an activity that requires coordination, so make sure to get a fireteam of people together that want to do it with you. Once you get to 600+, you can then start on Black Armory content, if you have the Season Pass. So far, I think the content is good, and I like the activities they have introduced. The forges are fun and quick, the Scourge of the Past raid is interesting mechanically and relatively easy compared to Last Wish, and the gameplay loop has been designed in a way that allows me to get rewards for playing efficiently, something that I find engaging personally. Leveling to 600 is pretty much painless due to increased prime engram drops. It's basically a two week grind instead of a month long slog. IGN gave the Black Armory DLC a 5.5/10 rating. They reserve the right to change that rating if things improve. Considering its $10 i give it an 8/10. 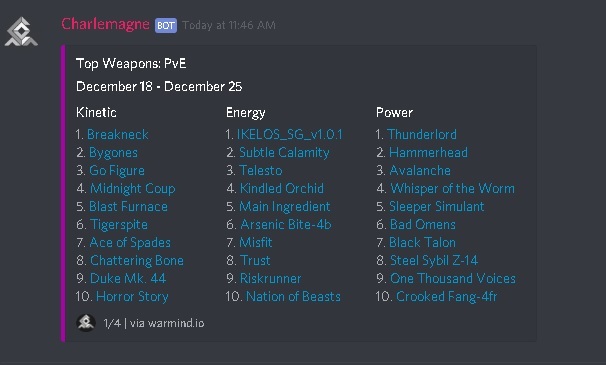 It would be an 8.5/10 if day 1 players didn't have to play non-Black Armory activities to get up to 610 power. Destiny 2 Scheduled Maintenance is complete. "Fixed an issue where weapon frames would be removed from inventory in error when completing alternate forges." i'm not sure how this list is compiled. these are good questions. i'll figure it out and report back. Charlemagne is a Discord server. i have the MOD that does extra damage to "minor enemies". My Breakneck has RAMPAGE and ONSLAUGHT on it. My Breakneck is masterwork-ed. So I leave the big tough enemies to my team mates a lot of the time. I mow down small minor enemies in big numbers pretty fast, as a result, i'm pumping out orbs of light like crazy. I'm able to contribute to fireteams of players that are quite a bit better than me. the "!pve meta" command returns the most popular weapons in PvE activities. Breakneck is a pinnacle weapon so everyone's comes with rampage and onslaught and is fully masterworked. For it the best mods are Rampage spec which increases rampage duration from 3.5 seconds to 4.5 seconds, followed by Minor Spec or Major Spec. Don't use Backup Mag on it, it only boosts magazine size to 45 from 40. The latest "Oracle Offering" showed an interesting cinematic. WARNING: this is spoiler so i put it in spoiler tags. Here is the cinematic itself. IGN's Fireteam Chat guys revealed a bunch of lore details behind what occurred during the Oracle Offering cinematic. WARNING: this is spoiler so i put it in spoiler tags. So if Uldron is a guardian he has no memory that Mara Sov is his sister and no memory of killing Cayde6? This sets up all kinds of new possibilities. I think someone can only suspend their disbelief from this point forward if they play the game on at least a casual level. Outsiders looking in on this kind of stuff will probably react the way the average non-fan reacts to stuff like Bizarro-Superman. The average non-player is going to say "well in this universe death does not mean much.. They can sell you a $40 expansion pass and then bring back everyone from the dead and then kill them off again in the $60 sequel." Guess with the next price tag they bring Cayde back. you never saw Uldron get executed so they intentionally planeted doubt in our minds right from the start. They better not resurrect Cayde6 though and they better be careful who else they bring back to life. i prefer no one gets brought back from the dead after being killed off. under a blanket, on some sort of altar. And even if, he would have been imprisoned if alive.